This costume choice is as popular as much as it is a classic. While nobody can do it like Anjelica Huston or the late Carolyn Jones, I am sure that you can still rock this look because a) black clothing makes up 99% of your closet and b) her sarcastic, dark-humoured, and melodramatic character speaks to you on many, many levels. Similarly, this costume is versatile that it can be worn solo, as a couple (add Gomez, and yell Mon Cher, while being addressed as Cara Mia), or mother-daughter duo (add Wednesday). Lastly, long black dress and hair/wig, red lipstick, decor skull, and falsies are a must. I can vividly remember that time in Cancun, where our trip to Coco Bongo, a nightlife venue with live performances, brought out major hysterics from one of my friends. The reason? Beetlejuice flying around the venue and interacting with the club-goers. That moment taught me what true fear looks like. While you don’t have to be as scary or sleazy as the original Michael Keaton’s character (unless you want to, which I will whole-heartedly support and expect photos of), you can still channel your inner crazy with a more ‘clean’ and feminine look, involving dark-purple eyeshadow, green hair tips, and the classic black and white striped suit. 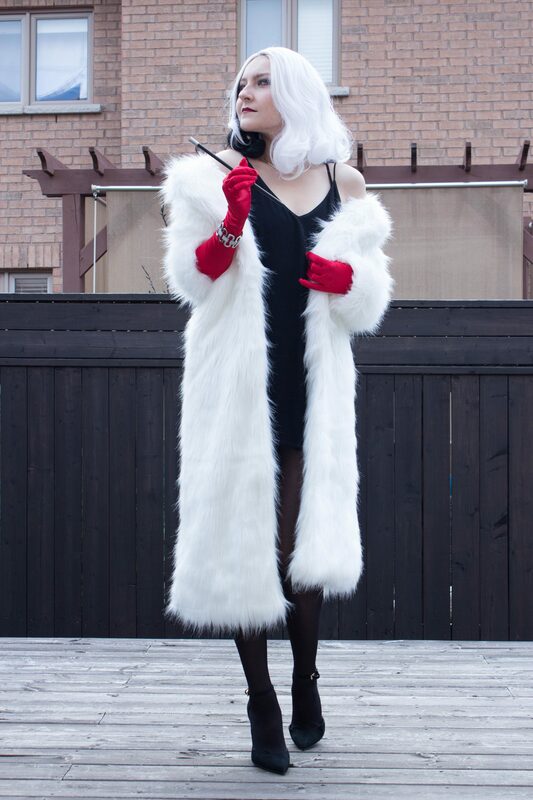 I can’t quite pinpoint the reason for my fascination with Cruella De Vil’s character and look, as it could either be due to the one acceptable reason to wear an over-sized, glamorous, faux fur coat or the fact that Glenn Close’s performance and costumes rendered a spread in Vanity Fair. Either way, I am not only smitten by the haute couture and glamour ‘feel’ of this costume, but also by the many different variations to this look while still staying true to the original character. For example, many have opted for a shorter coat, a wilder hairstyle, or completely omitted the green eyeshadow. Regardless of your choices in details, this costume is a great option. Let this costume be the tiniest glimpse into my fixation with Mean Girls, and quoting them continuously, whether appropriate or not. Should you not have a wedding dress just casually hanging in your closet, step into Tribal Rythm, at 248 Queen St W, where you will have a chunky selection of second-hand wedding dresses. Add long black hair, red lips, and monster teeth, and you are set. Similarly, should your mascara not be Loreal’s Voluminous LashParadise and decides to run a marathon down your face, you can walk around saying “She took him back. Regina took Aaron back.” People. Will. Understand. I promise. Despite this costume having a higher level of difficulty on the character execution scale, I still think that anybody can hit it out of the park. If make-up is your interest and skill, fishnet make-up tutorials are in abundance these day on Youtube, and require only fishnets, bright colours, and patience. Similarly, toy snakes and gold spray paint can easily create the head piece, which IS your costume in a nutshell, aside from the toga. Lastly, getting creative and wild with accessories is a must. While I appreciated the Asylum and Coven seasons of The American Horror Story slightly more than the Hotel, Sarah Paulson is incapable of letting her audience down. Her character is quite dark, persuasive, and troublesome, as is her appearance. Under the cheetah print coat, she wears a purple mini-dress with torn fishnet stockings, while accessorizing with a black choker, black pumps, and dark make up. That crimped hair is a definite requirement, I know you all miss that style (That’s a hard No for me though). What better way to show your captivation with both McKenna and Paulson than to dress up as her for Devil’s Night (October 30th), or whenever that party of yours is. Lastly, if you are a complete mess and have no time to even think about the previous costumes, let alone put one together, this costume is all you. Robe? You already have one. Rollers? Yup, you got that too. No-make-up-and-super-stressed look? Naturally easy. Plush cats? Pick them up on your way from your 4th Starbucks run. And you are ready to go have a good time. Hope you enjoyed my costume picks! I would love to hear about your costumes and plans. *Note: While I tried my best in obtaining original sources for pictures, most of them were from Pinterest and did not contain an original link. Should you, the owner, wish to have your photo removed or appropriately credited, please don’t hesitate to contact me. Thank you. My plans are hanging out with you.